ColdCut has a cool "zoom slider", that allows scrolling and zooming in the audio data at the same time. 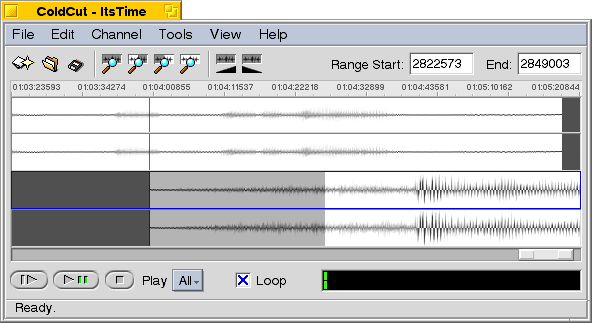 The audio waveform is rendered with anti-aliasing, which can get quite slow for large files. ColdCut is better suited for smaller clips, but is intuitive and fast to work with in that environment. Copyright © 1999-2005 Ingo Weinhold und Stephan Aßmus GbR "YellowBites"